Ello, nerds! It’s that time again. 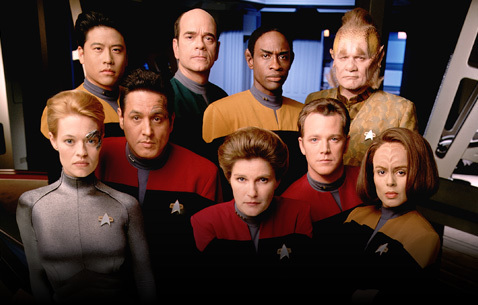 Cate has made it through season 4 of her Voyager re-watch which means … *insert Voyager theme song* it’s time for a new ‘Best Of/Cate’s Faves’ list! Okay. I am so not the biggest fan of 7 of 9. Never was, never will be, but she is an important part of this episode. Plus, the Janeway ‘tough mom love’ storyline is a fave. Communicating with the Borg, our dear Captain tries to give them a way of combating species 8472 with fancy nano probes that the holo Doc created. That is, until she and her crew realize the Borg started the conflict. During a battle, the Borg beam to Voyager and take over a cargo bay leaving the Captain in bad condition and needing surgery. Chukkles circumvents her orders and a whole mess of crap happens that leaves our intrepid crew beyond Borg space and with a drone of their own. Joy. Give the Captain a migraine for a week and see what happens … I dare you. Holo-Doc and 7 to the rescue! So, some jerk with a time ship thinks he can change history. Voyager intercepts him and his ship which throws the ship into the ‘Year of Hell’. These two episodes show us just how determined Captain Janeway can and will be to get her ship and crew home. More tender J/C moments … don’t worry, by season 5 the writers were over it (the fans are another story …). Who doesn’t love John Ryes Davis? And playing da Vinci? Fabulous. An alien steals da Vinci’s program as well as some other serious Voyager components (the holo-Doc’s mobile emitter, the computer core, transporters, etc.) which sends the Captain and Tuvok to the surface (in civilian clothes) to find their missing gear. The result is rather fun. Oh, these jerks. Voyager starts to receive messages from home via a relay station owned by The Hirogen. These guys are mean and mean-looking. They live to hunt and are ticked Voyager seems to think they can use the relay station. Letters from home are nice, but now we have a new enemy. Good episode in that the crew does get letters from home and we get to see some happy, some sad and some angry things come from it. Keep an eye on The Hirogen, they come back. They’re back! And this time, The Hirogen have turned Voyager into a flying holodeck with live pray they can control. Fun, right? If you think Janeway and Neelix as Klingons is fun (I happen to, btw). Get ready for some Nazi’s and Jeri Ryan singing! It’s going to be a fun ride! This is one of my favorite two-parters of the series. Not just for the costumes (okay, for the costumes …), but for the storyline. It’s intriguing and fun. Yep, last one on the list. Nope, not the finale. In fact, this is 3 episodes before the end of the season. An alien race 700 years in the future find the Doc’s mobile emitter and reactivate him. They have some real interesting ideas about what Voyager was really like (the ‘war ship’ Voyager? Huh.). Evil Janeway is a blast and Chakotay’s facial tattoo takes over his face. Kind of out of place, but a fun look at what Voyager ‘could have been’. I was not such the fan of season 4. Wasn’t bad, wasn’t great, was just okay. The finale could have been better. Without The Killing Game, I probably would have skipped this season in the average re-watch, but there are some gems to glean from it. Now, on to season 5! Live long and stay nerdy!